1) SJBA is organizing a 3-day Vipassana Meditation Retreat from 6 to 8 November 2018 in SJBA Vihara, to be conducted by Ven. Nyanaramsi Maha Thera, the Abbot of SJBA. If you wish to join in the retreat as yogi or wish to sponsor food for the monks and yogis, and other expenses during the Retreat, please contact our Office Administrator for more information. 2) This year’s Kathina Ceremony in SJBA will be held on Sunday, 11 November 2018. Kathina is a traditional Buddhist Ceremony started by the Buddha Himself for lay devotees to offer robes and other requisites to the Sangha at the end of Vassa (rainy season). The Ceremony will begin on the Eve, 10 November 2018 at 8pm with Taking the Three Refuges, Dhamma Talk, Procession around the Vihara, Sharing of Merits and a light refreshment. On Kathina Day, 11 November 2018, the Ceremony will start at 8.30am with with the Taking of the Three Refuges, Offering of Robes and other Requisites, Sharing of Merits and Lunch Dana. A blood donation campaign will also be held on this auspicious day. Please come and join us to perform these meritorious deeds together. 3) SJBA will organizing a 10-day Vipassana Meditation Retreat from 3 to 12 January 2019. The Retreat will be conducted by Sayadaw U Sobhita. Sayadaw U Sobhita is a highly respected meditation teacher at the renowned Chanmyay Meditation Centre, Yangon, Myanmar. He was born in 1951 and was fully ordained as a Bhikkhu by the Most Venerable Sayadawgyi U Janakabhivamsa in 1970. He studied the Dhamma under Sayadaw U Tejavanta, Sayadawgyi U Janakabhivamsa and other famous Sayadaws in Myanmar. In 1983, he practised Vipassana Meditation under the guidance of the late Mahasi Sayadaw. Since then, he has been teaching the Dhamma, especially meditation, to devotees in Myanmar and abroad. Sayadaw U Sobhita will be assisted by Sayadaw U Pinnyarnanda, the Abbot of Chanmyay Yeiktha Meditation Centre, Pyin Oo Lwin branch, Myanmar. If you wish to join in the retreat as yogi or wish to sponsor food for the monks and yogis, and other expenses during the Retreat, please contact our Office Administrator for more information. 4) SJBA invite you and family and friends to a spiritual and mentally enriching morning at this Sunday’s Buddha Puja. The Puja will start at 9.15am with offerings of lights, flowers, incense to the Buddha, Chanting, Dhamma Talk by Bro. Beng Chung on “ This Flower Is Beautiful” and Buddhist hymns. 1) There will be a special interest Talk on “Should A Person With Mental Illness Meditate” by Dr. Phang Cheng Kar (M.D.) this Sunday, 21 October, 2pm to 4pm at SJBA’s Multi-Purpose Hall (Basement). Dr. Phang is a consultant psychiatrist and mindfulness-based therapist at Sunway Medical Center. He developed the MINDFULGym which is a mindfulness-based stress reduction and wellness program. He is the President of the Malaysia Association for Mindfulness Practice & Research (MMPR) and KL Buddhist Mental Health Association. 2) SJBA is organizing a 3-day Vipassana Meditation Retreat from 6 to 8 November 2018 in SJBA Vihara, to be conducted by Ven. Nyanaramsi Maha Thera, the Abbot of SJBA. If you wish to join in the retreat as yogi or wish to sponsor food for the monks and yogis, and other expenses during the Retreat, please contact our Office Administrator for more information. 3) This year’s Kathina Ceremony in SJBA will be held on Sunday, 11 November 2018. Kathina is a traditional Buddhist Ceremony started by the Buddha Himself for lay devotees to offer robes and other requisites to the Sangha at the end of Vassa (rainy season). On Kathina Day, 11 November 2018, the Ceremony will start at 8.30pm with with the Taking of the Three Refuges, Offering of Robes and other Requisites, Sharing of Merits and Lunch Dana. A blood donation campaign will also be held on this auspicious day. Please come and join us to perform these meritorious deeds together. 4) SJBA will organizing a 10-day Vipassana Meditation Retreat from 3 to 12 January 2019. The Retreat will be conducted by Sayadaw U Sobhita. Sayadaw U Sobhita is a highly respected meditation teacher at the renowned Chanmyay Meditation Centre, Yangon, Myanmar. He was born in 1951 and was fully ordained as a Bhikkhu by the Most Venerable Sayadawgyi U Janakabhivamsa in 1970. He studied the Dhamma under Sayadaw U Tejavanta, Sayadawgyi U Janakabhivamsa and other famous Sayadaws in Myanmar. In 1983, he practised Vipassana Meditation under the guidance of the late Mahasi Sayadaw. Since then, he has been teaching the Dhamma, especially meditation, to devotees in Myanmar and abroad. 5) SJBA invite you and family and friends to a spiritual and mentally enriching morning at this Sunday’s Buddha Puja commencing at 9.15am with offering of lights, flowers and incense to the Buddha, chanting, blessings and Dhamma Talk by Ven. Indarathana and blessings by the Sangha. 1) This year’s Kathina Ceremony in SJBA will be held on Sunday, 11 November 2018. 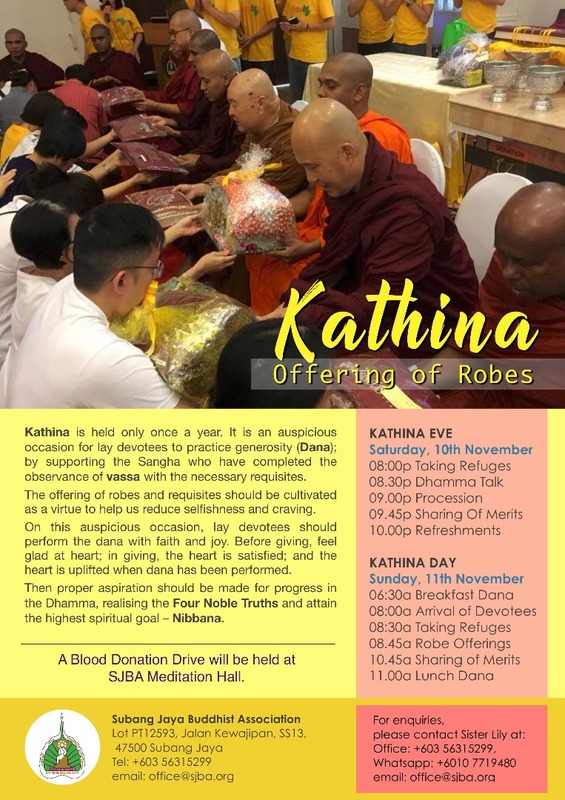 Kathina is a traditional Buddhist Ceremony started by the Buddha Himself for lay devotees to offer robes and other requisites to the Sangha at the end of Vassa (rainy season). 2) SJBA will organizing a 10-day Vipassana Meditation Retreat from 3 to 12 January 2019. The Retreat will be conducted by Sayadaw U Sobhita. Sayadaw U Sobhita is a highly respected meditation teacher at the renowned Chanmyay Meditation Centre, Yangon, Myanmar. He was born in 1951 and was fully ordained as a Bhikkhu by the Most Venerable Sayadawgyi U Janakabhivamsa in 1970. He studied the Dhamma under Sayadaw U Tejavanta, Sayadawgyi U Janakabhivamsa and other famous Sayadaws in Myanmar. In 1983, he practised Vipassana Meditation under the guidance of the late Mahasi Sayadaw. Since then, he has been teaching the Dhamma, especially meditation, to devotees in Myanmar and abroad. 3) All devotees are welcome to our Monday Metta Meditation session at SJBA Meditation Hall from 8.30pm to 9.45pm. This cultivation of metta focus on loving kindness to oneself, loved ones and all other beings. On every 1st Monday, our Resident Monk will be guiding the meditators especially the newcomers. 4) All devotees are welcome to have self-practice in Vipassana Meditation on Thursdays from 8.30pm to 9.45pm at our Meditation Hall. 5) There will be Day Retreat in SJBA during New Moon and Full Moon Days from 9am to 5pm. The Retreat is free and easy and participants can feel free to join in or leave any time. Vegetarian lunch will be provided. 6) SJBA invite you and family and friends to a spiritual and mentally enriching morning at this Sunday’s Buddha Puja commencing at 9.15am with offering of lights, flowers and incense to the Buddha, chanting, blessings and Dhamma Talk by Bro Tan Siang Chye and hymns singing. 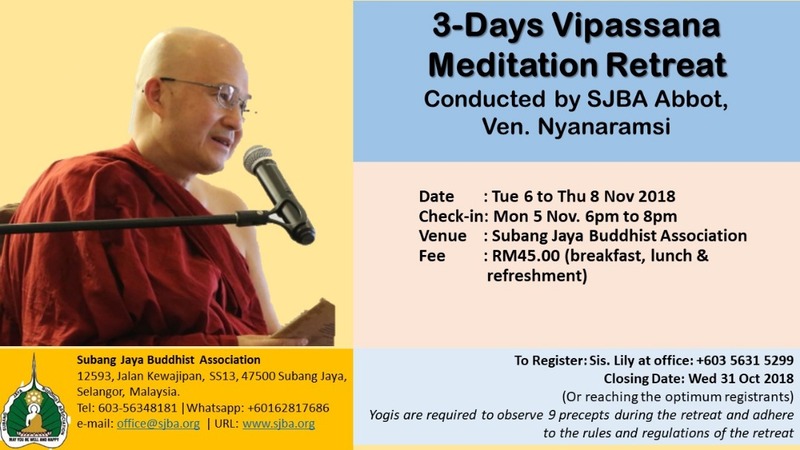 1) SJBA is organizing a 3-day Vipassana Meditation Retreat from 6 to 8 November 2018 (check-in on 5 November, 6pm-8pm), to be conducted by SJBA’s Abbot, Venerable Nyanaramsi Maha Thera. RM45 will be charged for breakfast, lunch and refreshment during the Retreat. If you wish to join in the retreat as yogi or wish to sponsor food for the monks and yogis, and other expenses during the Retreat, please contact our Office Administrator for more information. Closing date for registration: 31 October, 2018 or upon reaching the optimum number of yogis registering. The Ceremony will begin at 7.15am, 11 November 2018, with the Taking of the Three Refuges and Observance of the Five Precepts administered by the Sangha, Procesion round the Vihara, Offering of Robes and other Requisites, Sharing of Merits and Lunch Dana. A blood donation campaign will also be held on this auspicious day. Please come and join us to perform these meritorious deeds together. 3) SJBA will be organizing a 10-day Vipassana Meditation Retreat from 2 to 12 January 2019. The Retreat will be conducted by Sayadaw U Sobhita. Sayadaw U Sobhita is a highly respected meditation teacher at the renowned Chanmyay Meditation Centre, Yangon, Myanmar. He was born in 1951 and was fully ordained as a Bhikkhu by the Most Venerable Sayadawgyi U Janakabhivamsa in 1970. He studied the Dhamma under Sayadaw U Tejavanta, Sayadawgyi U Janakabhivamsa and other famous Sayadaws in Myanmar. In 1983, he practised Vipassana Meditation under the guidance of the late Mahasi Sayadaw. Since then, he has been teaching the Dhamma, especially meditation, to devotees in Myanmar and abroad. If you wish to join in the retreat as yogi or wish to sponsor food for the monks and yogis, and other expenses during the Retreat, please contact Sis Lily at 03-56348181 for more information. 4) All devotees are welcome to our Monday Metta Meditation session at SJBA Meditation Hall from 8.30pm to 9.45pm. This cultivation of metta focus on loving kindness to oneself, loved ones and all other beings. On every 1st Monday, our Resident Monk will be guiding the meditators especially the newcomers. 5) All devotees are welcome to have self-practice in Vipassana Meditation on Thursdays from 8.30pm to 9.45pm at our Meditation Hall. 6) There will be Day Retreat in SJBA during New Moon and Full Moon Days from 9am to 5pm. The Retreat is free and easy and participants can feel free to join in or leave any time. Vegetarian lunch will be provided. 7) SJBA invite you and family and friends to a spiritual and mentally enriching morning at this Sunday’s Buddha Puja commencing at 9.15am with offering of lights, flowers and incense to the Buddha, chanting, blessings and Dhamma Talk by Venerable Indarathana.